"Kundalini yoga is a science which works with the seven chakras, and the arcline and the aura (the Eight Chakra). It is your creative potential. You experience it when the energy of the glandular system combines with the energy of the nervous system to create such a sensitivity that the totality of the brain receives signals and integrates them. Then you become totally and wholly aware, and your creative potential becomes available to you". Kundalini is considered to be the most comprehensive of yogas, combining meditation, prayer, dynamic postures and breathing exercises (pranayama). "Kundalini" literally means "the curl of the lock of hair of the beloved". This poetic metaphor alludes to the flow of energy and consciousness that exists within each and every one of us, and enables us to merge with – or "yoke" – the Universal Self. Fusing individual and universal consciousness creates a divine union, called "yoga." Every individual is a manifestation of that energy, and the univers around us is the outcome of the same consciousness, ever revealing itself in various mode. The Upanishads, Hindu's sacred scriptures that date back to the fifth century B.C., describe Kundalini, although the oral tradition reaches back even further into history. For thousands of years, this sacred practice was veiled in secrecy, passed along verbally from master to chosen disciple. Kundalini yoga provides you varied techniques (dynamic postures, breathing exercises, mantras, music, and meditations), that you can choose according to your priority goals and your aspirations. It is accessible to all, whatever your age or fitness level. It does not require any adhesion with a philosophical or religious system. The practice of Kundalini Yoga balances the glandular systemand strengthens the nervous system. It enables us to harness the energy of the mind and the emotions, so we can be in control of ourselves, rather than being controlled by our thoughts and feelings. • To activate the vital circulation of energy which is regenerated for a better physical and mental balance. • To activate creative energies on the physical level by reinforcing the immune system and by stimulating the self healing systems. On the psychological level, it provides techniques to drive out the stress, to be centered and be emotionally pacified. These goals are achieved by a specific work on the physiological and psychological aspects which acts on the chemistry of blood, the nervous system, the endocrine system and the cerebral functions. With a more advanced level, it makes it possible each one to develop its own spirituality, to open its conscience and to develop its inner wisdom. • To peacefully cross the stresses of the life. • To maintain all the functional systems of the body in good health (disease prevention). • To reload in vital energy and to better manage this energy. • To improve quality of your sleep. • To be more centred, to better listen to yourself and others. • To better channel and control your emotions. • To step back on your physical and psychological difficulties, to better manage them and thus improve your behaviours in the family and professional life. • To become more conscious of what occurs in you and around you and thus to learn how to transform it in a positive direction. • To develop your optimism and your happiness in life. • To develop your capacity to give love and your aptitude to receive it. 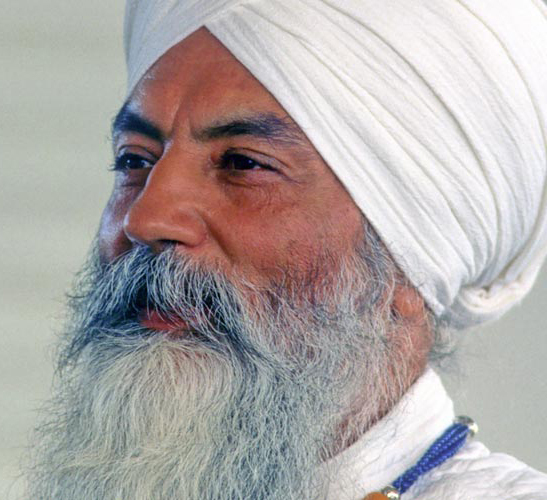 Kundalini Yoga is much more than just a system of physical exercises. It is a dynamic, powerful tool for expanding awareness. Approach it with respect, with reverence, and with openness.